Pottery peddler in Taal, c. 1903. Image source: Official Handbook of the Philippines 1903. The picture above has been taken from a public domain document compiled and published by the Bureau of Insular Affairs of the United States War Department in 1903. The document was entitled “Official Handbook of the Philippines” for distribution in the Louisiana Purchase Exposition in 1904. 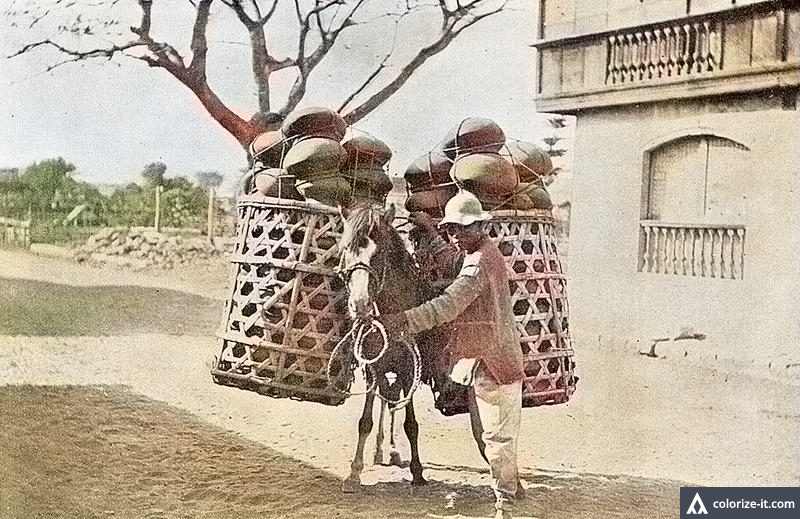 The picture was included in Volume I of the handbook, entitled “Description of the Philippines,” and captioned “Pottery dealer in Taal, Batangas Province.” It has been processed using graphic editing software and then colorized courtesy of Algorithmia.